Peace Week is a spring event planned in partnership with Peace Studies, Campus Interfaith Board, and other clubs and offices on campus.This year we will be looking at how storytelling can help inform peacebuilding. 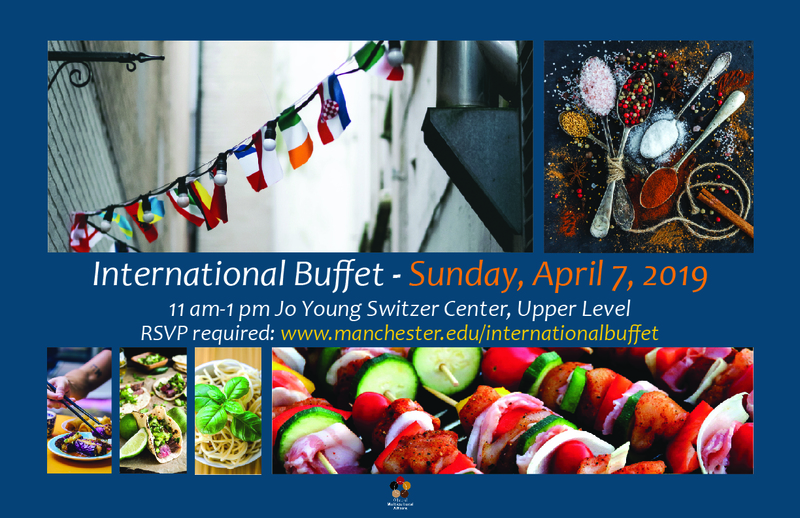 This event will also be a celebration of the 70th anniversary of the Peace Studies program here at Manchester. Barb Anguiano is an award-winning audio journalist and graduate of Indiana University. She’s proud of her Hammond roots and joined the WBOI News Team in the fall of 2018. Barb started her radio journey with the Transom Story Workshop in the Spring of 2016 and later joined WVPE in Elkhart, Ind. When Barb isn’t digging to the heart of and covering local stories, she enjoys the Rolling Stones, Doctor Who, dogs, dogs dressed as Doctor Who, and F1 racing. This is the keynote address for Peace Week. (Baseball) Manchester at Ball St.
Fellowship of Christian Athletes is hosting Jordan Lee Dooley and her husband, Matt Dooley (former NFL player), on April 5 from 8-9 p.m. in Cordier Auditorium. They will be speaking about dealing with failure when it comes to goals/dreams from a male/female perspective, as well as from a relationship standpoint. Please come out and join us! (Men's Golf) Battle at Belterra, Belterra Golf Club - Florence, Ind. Join us for a meal to help fight hunger in our world. Purchase a handmade bowl to fill with soup and enjoy a light lunch. Entertainment and children's activities will also be part of this event. All proceeds will be donated to the local Manchester Fellowship of Churches Food Pantry. Cost $14.99 for adults; Ages 11 and under $9.99; Free with meal plan. Many people do not take control of their health until a crisis hits. 'Code Blue' is a documentary that explores the current state of medicine and the practice of lifestyle medicine that can prevent, manage and reverse many chronic diseases. The film will be shown at 6 p.m., Monday, April 8 at the Fort Wayne campus of Manchester University, 10627 Diebold Road, and 3:30 p.m. Tuesday, April 9 in the Jo Young Switzer Center on the North Manchester campus. The North Manchester presentation is eligible for VIA credit. A panel discussion with area health experts follows the documentary. Come to discuss when you have felt excluded. We will generate ideas on how to combat this and build community together. o	Kenny Doss speaking about his life and how Bridging the Gap became what it is. o	Bridging the Gap is an organization that allows kids in Englewood, Chicago to play basketball and avoiding the pressures of inner city life. Visit opportunity for prospective students to get an introduction to Manchester - includes campus tour, College sessions, lunch, financial aid info, and more. The Manchester University Department of Music presents an afternoon recital with compositions by Dr. Debra J. Lynn, MU director of choral organizations and vocal studies. Local children are invited to the 25th annual Easter Egg Hunt at Manchester University. A parent or guardian must accompany all children at all times. Please consider how you can help current students to grow through personal and academic exploration at Manchester. Your gifts enrich classroom experiences, support mentoring and one-on-one research with dedicated faculty and maintain a safe and welcoming campus. (Men's Golf) Earlham Spring Invite, Richmond Elks Lodge & C.C. (Women's Golf) Earlham Spring Invite, Richmond Elks Lodge & C.C. #Don'tBeIt alcohol education is a student-led experiential learning VIA that encourages students to learn while participating in activities. There will be punch cards to show that you have participated in the required number of activities that will be available between 4:30 and 7:30 p.m. Note change of location: It is in the upper level of the Jo Young Switzer Center. Make sure you have your student ID with you for VIA credit. (Outdoor Track & Field) HCAC Championships at Mount St. Joseph, @ Cincinnati, Ohio, 3 p.m. In the Academic Center and Jo Young Switzer Center. (Outdoor Track & Field) HCAC Championships at Mount St. Joseph, @ Cincinnati, Ohio, 10 a.m.
Senior Rocco Angone will speak about the relationship between how valued we are as individuals and how that contributes to one's mental health. This is part of the VIA Senior Series.